Things have been a little up and down lately for Down Under classic rock revivalists Wolfmother. About a year ago, we told you that the band had called it quits, only to have front-man Andrew Stockdale recruit new members just months later. 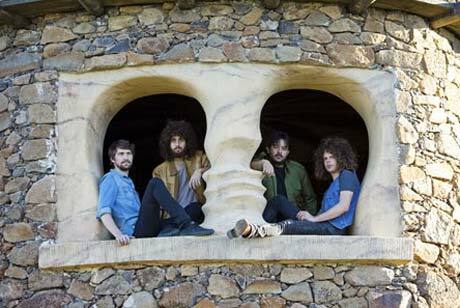 Now, it's been revealed that the revamped Wolfmother have prepared their sophomore full-length. Called Cosmic Egg, the unfortunately titled record is due out on October 13, with first single "New Moon Rising" coming out the week before. With new members Ian Peres, Aidan Nemeth and Dave Atkins joining Stockdale, Cosmic Egg also marks the first time Wolfmother have performed as a four-piece. Meanwhile, former Wolfmother members Chris Ross and Myles Heskett have teamed up with Canadian turntablist Kid Koala for a fall Canadian tour (you can check the dates out here). 12. "Violence of the Sun"